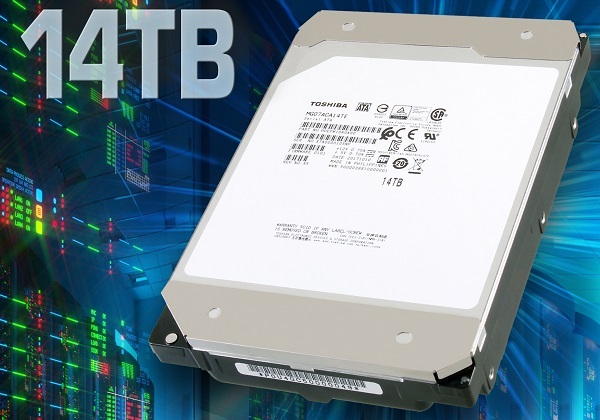 TOSHIBA debuts world's first 14TB HDD with Conventional Magnetic Recording (CMR). Toshiba Corporation today announced the launch of the MG07ACA Series, the world's first enterprise 14TB Conventional Magnetic Recording (CMR) HDD. Using a 9-disk, helium-sealed design, the new MG07ACA Series provides the power-efficient capacity and storage density needed by cloud-scale and enterprise storage solution providers to achieve their TCO objectives. The MG07ACA Series features both 14TB 9-disk and 12TB 8-disk models. The helium-sealed 3.5-inch mechanical design realizes better storage density and a lower HDD operating power profile than the previous MG06ACA Series for optimal TCO in cloud-scale infrastructures. The series also utilizes Toshiba Group's laser welding technology to ensure the helium remains securely sealed inside the drive enclosure. The drives support a SATA 6Gbit/s interface and 7,200rpm access performance. The 9-disk 14TB models achieve a 40% increase in maximum capacity over previous MG06ACA 10TB models. Additionally, the 14TB models improve power efficiency by over 50% (W/GB). Sample deliveries of MG07ACA Series drives to customers sequentially begin today.